This is the largest and most ambitious festival ever held in Baja, said Erik Cutter, the publisher of Baja Life Magazine. There are tequila festivals as well as mariachi festivals in Mexico, but nobody has really put the two of them together. Tequila and Mariachi is the true essence of Mexico and in our attempt to bring international attention to La Paz, it dawned on us that these elements are widely recognized in the international community as being 100% pure Mexico. Thus it follows that tequila and mariachi create a rich cultural foundation for an annual festival. The Baja Communications team and Ramon Ascencio of Baja Tours not only put together a celebration honoring Mexicos finest traditions of tequila and mariachi, but over the course of the week-long festival orchestrated a Baja photo exhibit, a Mini-Bisbee fishing competition for the children of La Paz (see separate story, click here), a series of intimate tequila tastings hosted by Tequilero Extraordinaire John Bragg of Cabo San Lucas, a Taste of La Paz celebration supported by local restaurants, a series of kayak races, plus a marathon that was held on the last day of the festival prior to the closing ceremonies. The booming trumpets and sweet violins of Mariachi, performed by the talented nine-man ensemble Los Arrieros from Los Mochis, one of many groups playing at the festival, signaled the start of the celebration every evening just before sundown at the pier and along the malecon. As a variety of local and visiting musicians brought their rousing music to the stage under the stars, crowds found their way to the entertainment area where they were met by vendors who were offering samples of some of Mexicos finest tequilas, including Herraduras full line  from blanco to reposado to anejo. For the more adventurous, Herradura and Don Julio tequilas were poured at the more intimate yet casual tequila tastings hosted during the week at four great venues including Bougainvilleas Restaurant, Tequilas Bar and Grille, the Cortez Club and La Paz Lapa. John Bragg, the owner of Panchos in Cabo San Lucas and a renowned aficionado in the art of fine tequila appreciation, came to La Paz to educate and inspire guests interested in the fine points of tequila production, appreciation and its deep cultural roots in Mexico. At each venue, local Pacenos, resident Americans and tourists gathered to hear Johns expert words before he guided them through a tasting session that included some of Herraduras finest, in a range of styles and ages. This segment of the festival was particularly successful as it allowed local attendees to sample the fine spirits of Mexico in comfortable local settings along with fine food provided by each restaurant. The Baja Foto Fest photography exhibit, sponsored by Foto La Paz, drew a lot attention at the pier with striking photos of Baja Sur in four different categories: people, places, fauna and flora. The big winner was Miguel Angel de la Cueva. For his contributions, Miguel received a prize of $500 US and a four-day/three-night vacation from Baja Tours. Ramon Ascencio owner of Baja Tours in La Paz, and who is the Vice President of Promotions for the La Paz Hotel Association, was the point man on many of these events. The Kayak Regatta was especially great, Ramon said. This event was attended by over 30 kids from Ciudad de los Niños, a local Foster Children Hostel that is managed by the Catholic Church. For many of these children, this was the first time they had ever seen a kayak. We also had the participation of the local varsity Paddling club and some Aero California Pilots that raced on the half-mile sprint. It was a day full of fun and laughter. Baja Communications Group and Baja Tours has established an exciting new cultural event in the capitol of Baja Sur. The festival will move to locations in Los Cabos and Loreto later in the year. 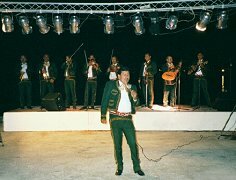 For information on dates for future Tequila and Mariachi Festivals in Baja, please visit: http://www.vivatequila.com or http://www.bajatours.com. copyright © 1996-2002 Baja Life Online. All rights reserved.